Former Trump campaign aide George Papadopoulos has offered yet another indication that Attorney General Jeff Sessions may have perjured himself when testifying before Congress about the campaign’s Russia links. In two television interviews and a court filing, Papadopoulos shared his account of a March 2016 Trump campaign meeting — the first full meeting of Trump’s national security team — during which he told Trump and campaign officials that he could set up a summit between Trump and Russian president Vladimir Putin. Sessions, a close ally and campaign advisor to Trump, was “quite enthusiastic” about the potential meeting, according to Papadopoulos — a detail which directly contradicts what Sessions told Congress under oath last year. Papadopoulos was sentenced to 14 days in jail on Friday after having pleaded guilty in October to lying to federal investigators in order to conceal his Russia contacts — lies that he has said were intended to protect himself and President Trump. Special Counsel Robert Mueller’s team had specifically requested jail time, arguing that Papadopoulos’s deceptions harmed the Russia investigation during its critical early stages and prevented U.S. authorities from detaining and questioning the Kremlin-linked professor, Joseph Mifsud, who Papadopoulos had met with several times in an attempt to set up the Trump-Putin meeting. In Friday night’s CNN special on Papadopoulos, the former aide elaborated that he “looked at candidate Trump directly in his eyes and said, ‘I can do this for you if it’s in your interest and if it’s in the campaign’s interest.’ And the collective energy in the room, of course, there were some dissenters, but the collective energy in the room seemed to be interested.” The dissenters were apparently conservative think tank members on Trump’s national security team, but Papadopoulos singled out Sessions as having the opposite reaction. Sessions’s lawyer, Chuck Cooper, told CNN that the attorney general “stands by his testimony,” while the Justice Department declined to comment on the matter. If Sessions perjured himself, convicting him of that would likely be very difficult, since it would have to be proved that he knowingly lied about his response to Papadopoulos’s offer. 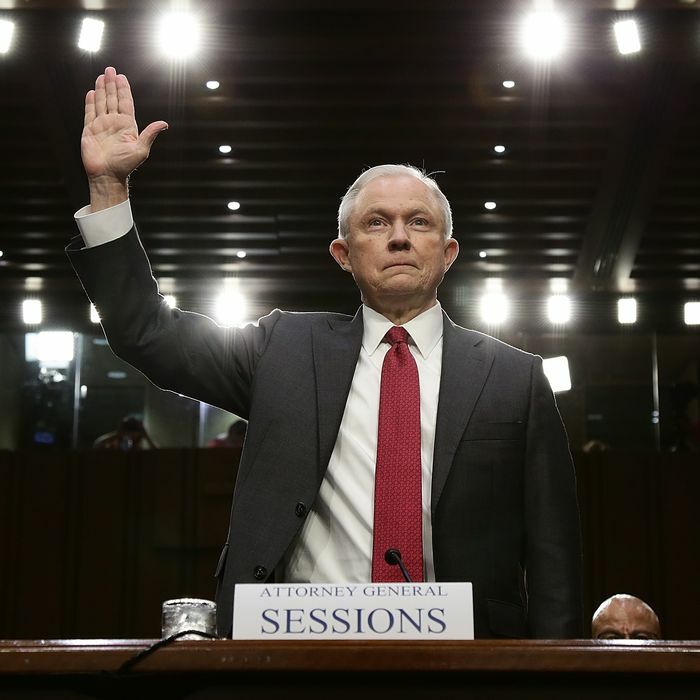 This is also not the first time that Sessions’s statements to Congress regarding his and the Trump campaign’s Russia contacts have turned out to be false, and he has yet to face any consequences other than being pressured to recuse himself from any role in the Russia investigation. Trump has wanted to fire Sessions for that decision ever since. When pressed by Stephanopoulos on whether he was indeed saying that Sessions had lied, Papadopoulos hedged, replying instead that, “All I can say is this — this was a meeting from about two years ago — my recollection differs from Jeff Sessions’s.” He added that “the [Trump] campaign was fully aware with what I was doing” with regards to his attempts to set up the Putin summit, including campaign manager Corey Lewandowski and campaign adviser Sam Clovis. “I think Sam Clovis was telling me ‘excellent work’” at the time, Papadopoulos recounted. Papadopoulos was cryptically non-committal, however, on whether or not he also told Trump campaign officials about the possible hacked Clinton emails he later heard about from Mifsud. Another Trump campaign staffer, John Mashburn, has testified that Papadopoulos sent him an email mentioning the hacked Clinton dirt. Papadopoulos said he had “no recollection” of that and noted that evidence of the email hasn’t turned up, but added that he could not “guarantee” that he didn’t share news of the Clinton dirt with others on the campaign. If Papadopoulos did tell other campaign officials about the hacked emails, or if any of the other attendees of the March 2016 national security team meeting witnessed Sessions’s response to Papadopoulos’s summit offer, we may have to wait for the Mueller investigation’s full report to find out.